I always knew I wanted do make something from WWI for this challenge. Since this year marks 100 years since the war broke out, that's not so very remarkable. But I had had war time recipes on my mind since last year when I did a project for my history course about a particular event that took place i Stockholm in 1917. 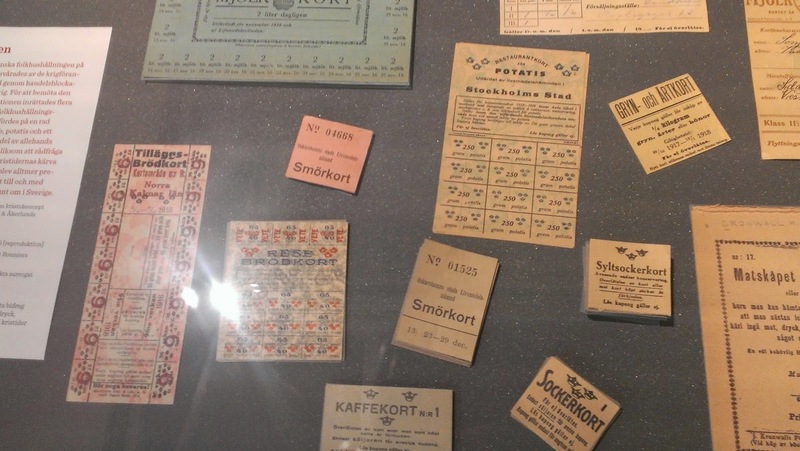 While researching that event, it was hard not to notice the many references to the food shortage in Sweden at the time. Queuing for bread in Stockholm. 1917-18. Stockholms Stadsmuseum. Sweden was a neutral country during WWI and was thus spared most of the horrors that the warring nations endured. Food shortages did however become more and more dire as the war progressed, especially in urban areas. By 1917/1918 almost everything was rationed and the things that weren't were mostly unavailable anyway. As you can imagine, frugality was not just a virtue but a necessity. Park turned into potato field close to where I actually live now. Stockholms Stadsmuseum. I couldn't get hold of the cookbook I wanted to look at (a 1917 book with war time recipes sent in to a newspaper by the readers!) 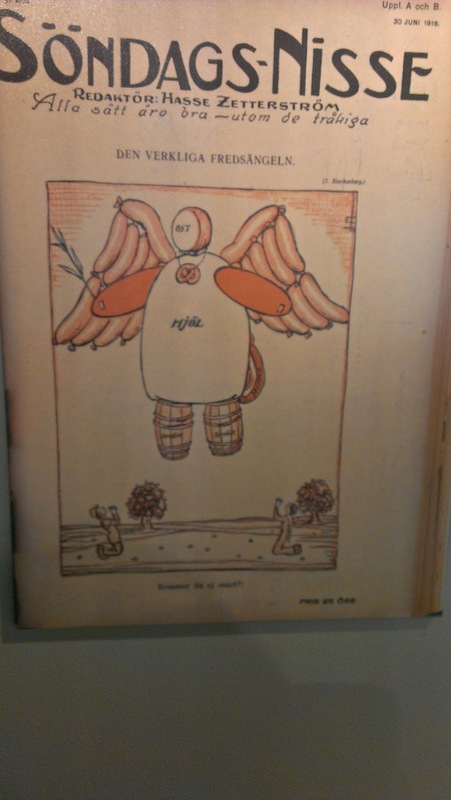 because it was presently on display at the National Library - in a small exhibition about WWI from a Swedish perspective! How's that for coincidence! 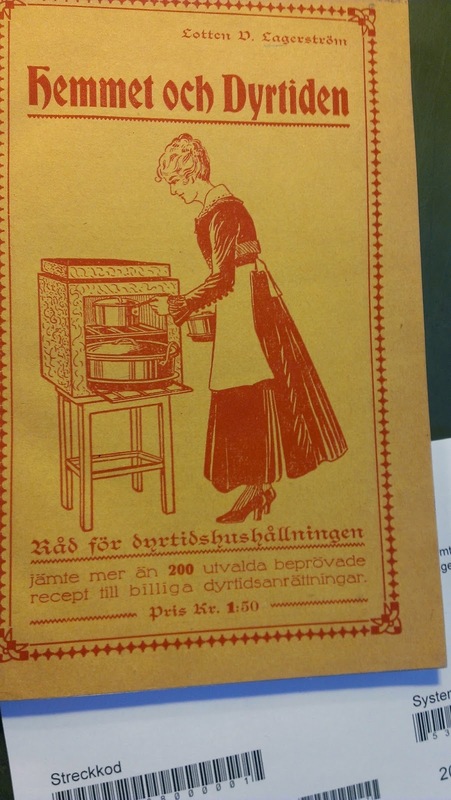 I did however find two other books about cooking in "expensive times", both from 1917, and had a good look at them. "The home and the expensive times", L.D. Lagerström, 1917. I felt kind of bad about it, but my initial response was to feel... disappointed. 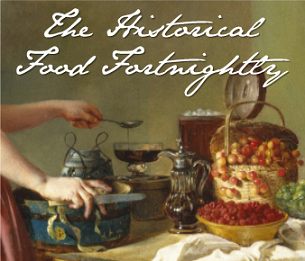 Most of the recipes in the book didn't feel that different from other "everyday" cookbooks of the time. I had kind of expected things like "hedgehog stew", "grass bread", and "chicken feet pie" (well, maybe not exactly those, but you get my drift I hope!). Here were recipes mostly based around meat, although often with a meat-saving aim, and butter, sugar and eggs were not at all excluded. It made me wonder how useful these books were to the struggling housewife at the time? And who bought these books? Surely not the poorest of the poor, who might have had the most use for extremely frugal recipes. My belief (although they're mostly speculations) is that these kind of books were targeted against a middle class that until these hard times hadn't really felt the lack of good food. These books picked up on what the poor/working class might have eaten under normal circumstances and made it available to the classes that suddenly found themselves lacking food even though money wasn't the biggest issue. Kind of like a reversed "trickle-down theory", whatever that's called. But I digress. Whatever did I take back into my own kitchen from these books? 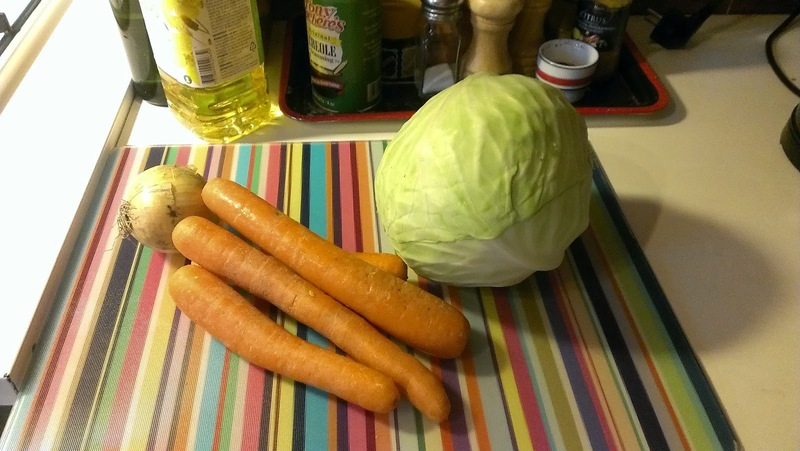 I picked a soup, simply called "Cabbage soup", mostly because it really felt like a "poor" recipe. No meat, hardly any fat, just cabbage, carrots and a lone onion. Very sad. But cheap, at least today and probably one of the cheaper meals you could imagine even in 1917. 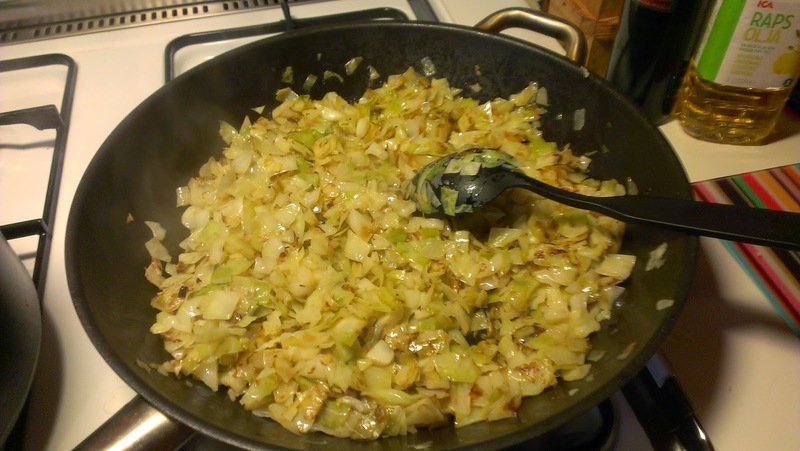 The recipe is as short as the soup is meager: Clean and chop one small cabbage and fry in fat until brown. 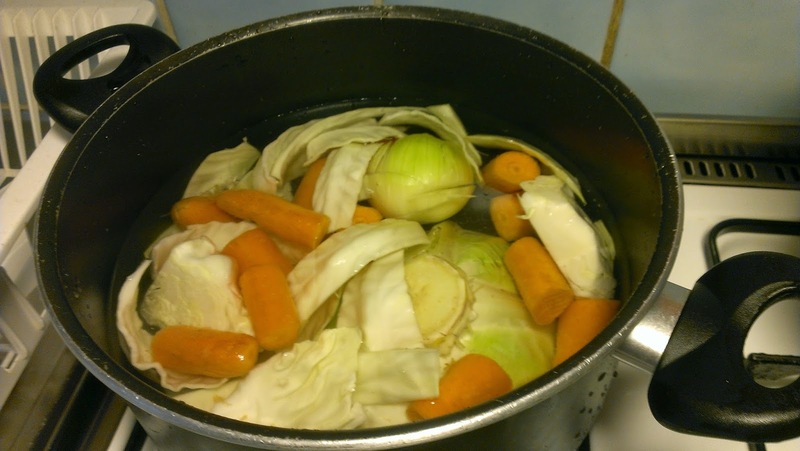 Add stock made from the root and the tough pieces of the cabbage, 4-5 carrots and an onion. Salt and pepper to taste. Cook for a long time on a slow fire or in a haybox. I fried it in lard and margarine. I decided that butter was off-limits for the purpose of accuracy, but most fats were scarce at the time. Perhaps some bacon-fat-from-last-night would have been more accurate, but I didn't have any saved. Anyway, I fried it until golden brown-ish (and a bit burnt here and there, but this is war. We can't be too picky here). Then I added the stock and some salt and pepper, and left the soup to it's own devices for several hours (this is about 1,5 hours in). It just said to cook "for a long time". A haybox would have been neat indeed, as the recipe suggested, and oh so accurate! All sorts of fuel-saving methods were tested and tried since coal and fire wood got more and more expensive along with everything else. I have a household book from the 1930's which goes a great bit into the virtues of hayboxes, so it was not just a wartime fad but were apparently in use until the mid-20th century when electricity and gas stoves became common and affordable enough. Anyway. It did cook for a long, long time - I lost track, but probably close to 4 hours (I had things to do, such as laundry, so time flew away, and the end result looked pretty much like in the picture above. But here's a picture of the final product, just because. 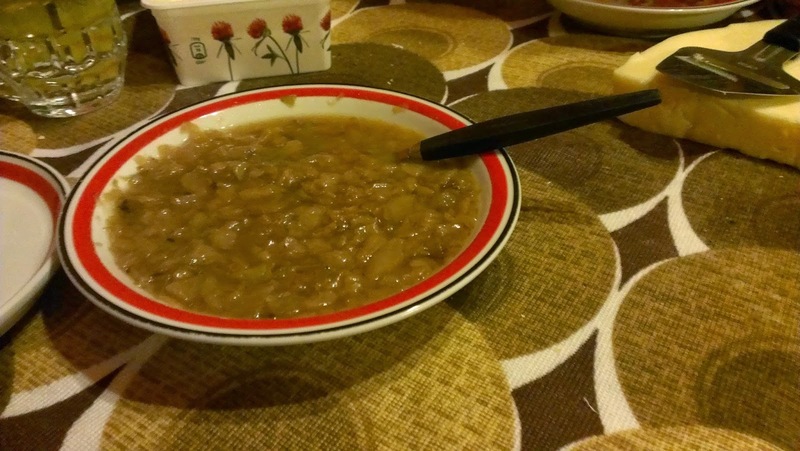 No, it's not a pretty soup but it tasted better than it's appearance suggests. Then again, I like cabbage, so it was pretty much what I expected. Cabbage. Mushy cabbage, with a sweetness to it, as cabbage tends to become rather sweet after a long cooking time. Exciting, no. But completely edible. A piece of sausage or something would have helped, and I'm not the kind of person that absolutely must have meat with every meal, but it could have helped this soup become "nice" rather than just "okay". The Recipe: See above. 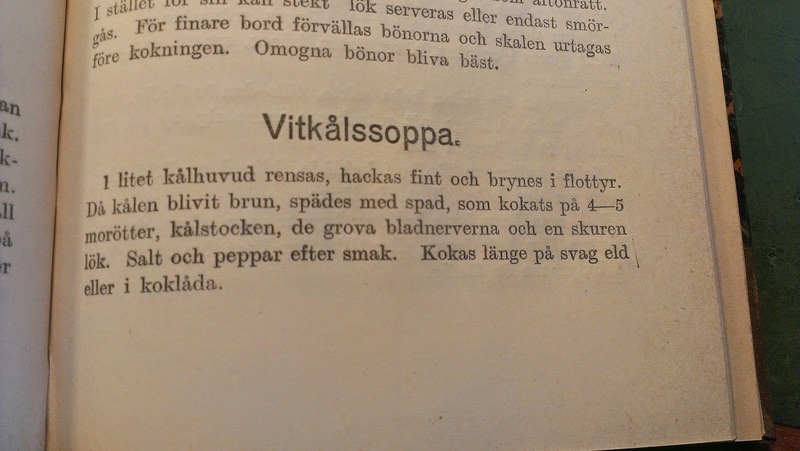 Cabbage soup from a Swedish cookbook on economic housekeeping during WWI. The Date/Year and Region: Sweden, 1917. 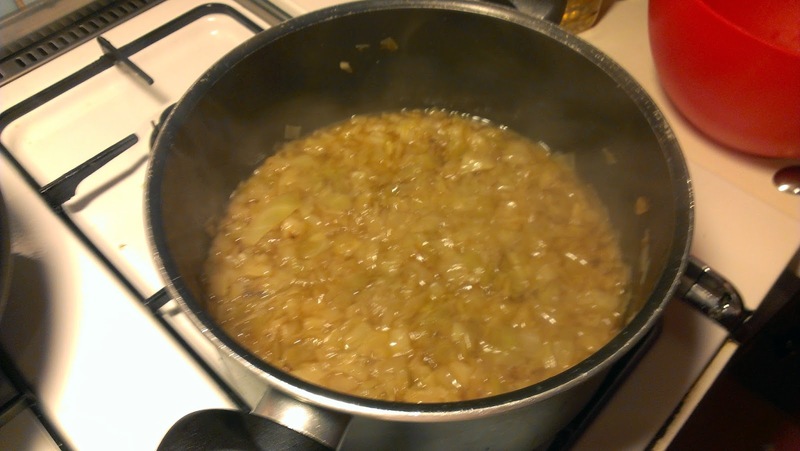 How Did You Make It: See above, but in short: a vegetable stock made from cabbage scraps, carrots and an onion, and chopped cabbage, fried brown, then put together for a looong simmer. Time to Complete: Ouch! Allowing for cooking time for the stock and the soup itself, at least five hours! This recipe is not frugal in a 'time' sense. Total Cost: This is so cheap. One cabbagae, four carrots and one onion. That's the cost! How Successful Was It? : Considering the few, bland ingredients, not bad. It's not a gourmet's meal but it's a somewhat nourishing soup made on the cheap and that's what it's supposed to be. How Accurate Is It? : The ingredients and the prep work is as accurate as could be. My pots and pans are of a modern variety, and a gas-top stove may not have been too common in 1917 (but not unheard of). Lagerström, L.V. (1917). Hemmet och dyrtiden: råd för dyrtidshushållningen ...(2. uppl.) Tingsryd: Nordiska konstförl..